God Created YOU to be A Woman of Purpose! When you look at the Bible stories of women, many of them occur only in the Gospel of luke. 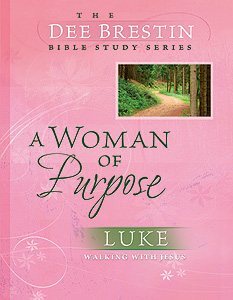 In this 12-lesson study, renowned teacher and bestselling author Dee Brestin reveals a primary source for Luke—the women who traveled alongside, and who ministered to Jesus (Luke 8:1-3). Jesus exhorted women and validated their purpose in His Kingdom. You are precious and valuable in God's sight—come discover His purpose for you. · See how God used Elizabeth to prepare Mary for Jesus' birth. · Witness mary of Bethany as she "hung on His every word." · Smile and understand as you read the account of Easter morning when the men said the "women's words seem like nonsense."